About 2 dozen people (both sexes) meet every WEDNESDAY from 2.00pm to play carpet bowls. We don’t take the game too seriously and there is a lot of laughter and fun to be had. We usually break for tea or coffee half way through, its a great place to meet new friends and have a chatter as well as enjoying the relaxation of a good game of carpet bowls. We are always on the look out for new members no experience necessary, its very easy to learn . Indoor Carpet Bowls – What Does the Game Involve? 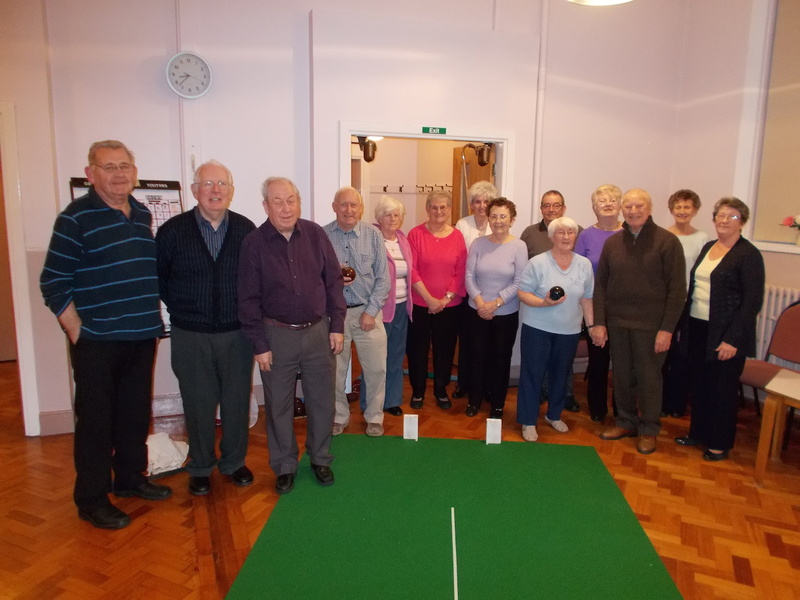 Indoor carpet bowls is played in village halls and community centres up and down the country. It is played on a 30 x 6 ft carpet and involves a jack placed 3 – 6 ft from the end of the mat and an 18 inch central block placed equal distance from the carpet ends. The block must be in a contrasting colour to the carpet and can be either rectangular, round or diamond in shape. This makes the game more skilful and entertaining as it prevents players bowling straight down the middle of the mat. Delivery is from an 18 inch area in-front of the carpet and bowlers should not stand on, kneel or touch the carpet when they play.